A quasar, the brightest type of object in the universe, is seen releasing massive amounts of energy as stars are shredded near the supermassive black hole of a galaxy in this artistic illustration. Quasars are the brightest objects in the universe, and display a mysterious diversity in their appearance that has puzzled astronomers for more than two decades. Now, scientists find this mystery can be solved by looking at two simple features of quasars — how quickly matter is getting fed into the quasars and the direction from which the quasars are seen. Quasars are supermassive black holes up to billions of times the mass of the sun that live at the hearts of distant, massive galaxies. They release extraordinarily large amounts of light as they rip apart stars and gobble matter. To help solve this mystery, scientists examined the largest sample of quasar observations yet — data from more than 20,000 quasars captured by the Sloan Digital Sky Survey. The collaboration's statistical analyses revealed that the appearance of quasars could mostly be explained by two basic factors. 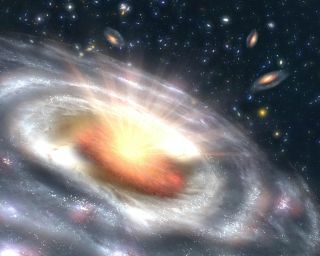 "Our work solves a two-decade-long mystery in quasar research," lead study author Yue Shen, an astronomer at the Carnegie Observatories in Pasadena, Calif.,told Space.com. The first factor is the so-called Eddington ratio — the luminosity of a quasar compared with its mass. This ratio predicts how quickly matter is falling into a quasar, and was long suspected to play a major role in why quasars often varied in appearance. The other factor is the direction from which astronomers look at a quasar, which influences how much they can see of the clouds of gas closest to the black hole. This fast-moving gas produces a broad range of wavelengths of light, greatly affecting a quasar's appearance, and these findings suggest that these clouds are arranged in a flattened disk, explaining why the direction from which they are seen can matter so much. "Our findings have profound implications for quasar research," Shen said in a statement. "This simple unification scheme presents a pathway to better understand how supermassive black holes accrete matter and interplay with their environments." In addition, these findings will help improve future measurements of black hole masses, which in turn will help scientists better understand "the cosmic growth of supermassive black holes and their place in galaxy formation," study co-author Luis Ho at the Kavli Institute for Astronomy and Astrophysics at Peking University said in a statement. Shen also noted there are several ongoing quasar surveys that will provide even more data "to expand the unification scheme established here." For example, this future data will help yield insights on smaller black holes, "which are fainter, and were missed in earlier surveys," he said. The research is detailed in the Sept. 11 edition of the journal Nature. You can follow Charles Choi on Twitter @cqchoi. Follow us @Spacedotcom, Facebook and Google+. Original article on Space.com.